of an equation in two variables. 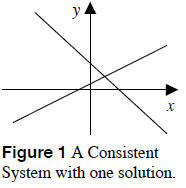 the solution(s) to the system of equations. in Two Variables has Three Possible Outcomes . . .
intersect. 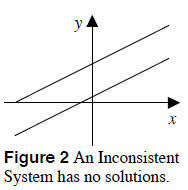 Therefore, there is no solution. empty is called an inconsistent system. 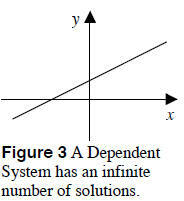 system of equations has infinite solutions. This is called a dependent system. 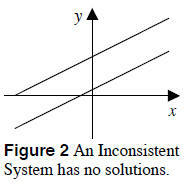 has no solution and the two lines are parallel. 1. Isolate one variable in one of the given equations. 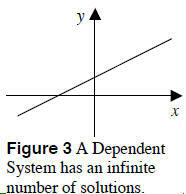 solve for the one variable remaining in that equation. 4. 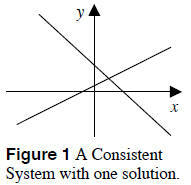 Write your solution as an ordered pair. produce a false statement, such as 4 = 0.
statement, such as 3 = 3. Recall If c ≠ 0 and a = b , then ac = bc . of equations is equivalent to the original system. rate of the plane in calm air and the rate of the wind. distance traveled. Organize the data in a table. 3. Write a system of equations that models the problem. 4. Solve the system of equations and answer the question. A canoeist paddling with the current can travel 24 miles in 3 hours. Against the current, it takes 4 hours to travel the same distance. $25. Find the cost of each type of bulb. $3.30. Find the number of dimes and quarters in the first bank.